After an epic 20 hour journey from Brunei, members of 1 RGR Battalion Headquarters (BHQ) and other personalities from across the Battalion arrived at Normandy Barracks in Germany to start an intensive week of Command and Staff Training (CAST). 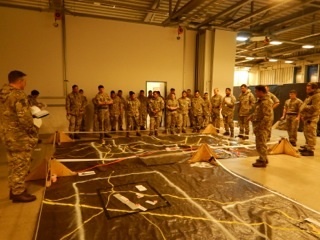 Following a mini CAST held in Brunei 3 weeks previously, the training presented BHQ personnel with an opportunity to refine skills and Standard Operating Procedures in preparation for the Battalion deployment to Kenya in February 2016. For the first few days the training focused on the planning cycle process, to ensure the team was in a good enough position to move on to more testing operations, before being tested with the challenge of planning and executing operationsconcurrently. The CAST was conveniently planned with a weekend in the middle, which meant that all involved could enjoy the Christmas festivities that the German markets have to offer in Paderborn. On Monday morning, the planning team were back in the Ops room planning rather more testing operations. The training concluded on Wednesday morning and following a very encouraging after action review, the buses were boarded to start the return journey. CAST was a great opportunity to test and confirm 1RGR’s readiness for Kenya, and although it required a huge amount of effort to get there from Brunei, it proved to be a highly valuable exercise.